Loops is a celebration of light, movement and sound. It is an open end game that connects people. One of the most important bridges in our society. By gathering around the installation, like at a campfire, you are influencing the sound and the light of the installation. A laser line is rotating every second around the center balloon. Whenever it is detecting a person on its path it will chang the sound and the light. The rotation of the laser is refering to the passage of time and at the same time creates a rhythm for the sound. With this installation we are changing a classic sound loop into an interactive playground. 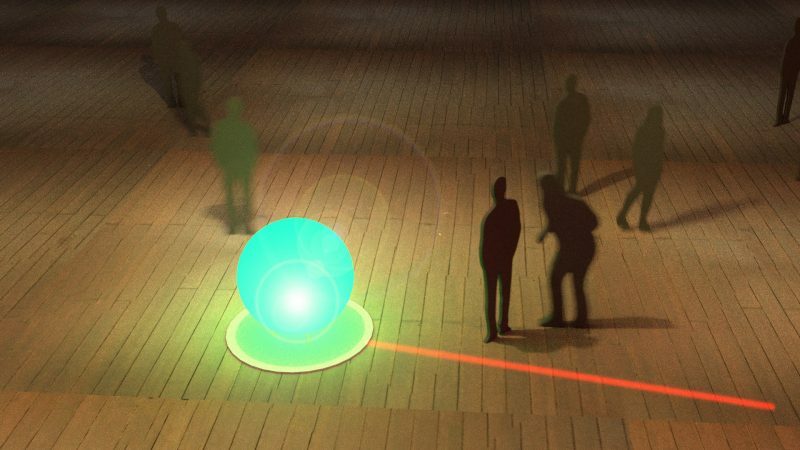 Loops exists out of two autonomous light bubbles. Each bubble reacts to its environment through sound and light. Each bubble has a laser line that goes in circles to set the pace of the beat. When somebody stands on the line, the rhythm of the audio changes, along with the color of the bubble. More people, results in a more dynamic sound and light experience. It allows for an open-ended play, exploring the infinite ways to set the beat of the loops.